Last January, Young Justice returned for its third season after being revived by DC Universe. However, only the first 13 episodes of Young Justice: Outsiders have been shown. But WonderCon’s DC Universe panel, the publisher revealed that the third season will resume on Tuesday, July 2. Young Justice: Outsiders introduced a new team led by Nightwing, with Superboy, Black Lightning, and Tigress/Artemis. Halo, Forager, and Geo-Force are the new recruits, with Cyborg potentially joining as well. 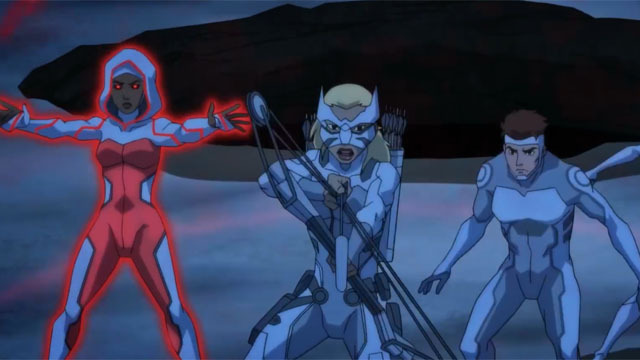 In the mid-season finale, Tara Markov’s fate was revealed, and the second half of the season teased a classic Teen Titans storyline. DC Universe also announced that the live-action Swamp Thing series will arrive sooner than expected. The first season will premiere on Friday, May 31. That’s exactly one week after the 15 episode first season of Doom Patrol will wrap up. Andy Bean is playing Alec Holland, while Derek Mears will portray his alter ego, Swamp Thing. Crystal Reed is co-starring the show as Abby Arcane, a doctor who was close to Alec before his transformation. Virginia Madsen, Maria Sten, Henderson Wade, and Will Patton have supporting roles. Ian Ziering is playing Daniel Cassidy/Blue Devil, with Jeryl Prescott as Madame Xanadu, and Kevin Durand as Jason Woodrue. Finally, DC Universe also confirmed that Titans will return for a second season this fall. However, an exact date has not yet been set. Are you excited to watch the rest of Young Justice season 3? Are you looking forward to Swamp Thing? Let us know in the comment section below!